If you’ve noticed frothy-like foam seeping from your tree, then it has likely been affected by alcoholic flux. While there is no real treatment for the disease, preventing alcoholic flux may be your only option to avoid future outbreaks. Keep reading to learn more frothy flux info. Alcoholic flux is a stress-related disease that affects sweet gum, oak, elm and willow trees. It usually occurs after a period of very hot, dry weather. The disease is caused by a microorganism that ferments the sap that seeps or bleeds from cracks and wounds in the bark. The result is a white, frothy ooze that has a sweet, fermenting odor similar to beer. Alcoholic flux is sometimes called frothy flux or foamy canker because of the white ooze that looks and feels like melted marshmallows. Fortunately, this ooze only lasts for a short time in summer. Anything that promotes the overall good health of the tree aids in preventing alcoholic flux. Symptoms usually occur after a period of extremely hot, dry weather, so water the tree deeply during dry spells. Apply the water slowly to encourage absorption to a depth of 18 to 24 inches. Water the entire area under the canopy of the tree and cover the root zone with mulch to cut down on water evaporation and keep the roots cool. A good annual fertilization program helps keep trees healthy and able to resist disease. For mature trees, this means at least one feeding a year, usually in late winter or early spring as the leaves begin to bud. Young trees benefit from two or three smaller feedings over spring and summer. 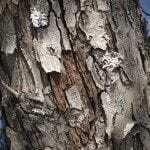 Wounds and cracks in the bark make it easier for the microorganism to enter the tree. Also, you should prune damaged and diseased limbs back to the collar. Use alcohol, a 10 percent bleach solution or a household disinfectant to clean the pruning tools between cuts so that your tools don’t spread disease to other parts of the tree. Take care when using a string trimmer around the tree, and mow the grass so that debris flies away from the tree rather than toward it to avoid chips in the bark. Unfortunately, there is no effective alcoholic flux treatment, but the symptoms only last a short while in a healthy tree. In severe cases, the layer of wood under the bark may become rotten and mushy. If the tree doesn’t recover properly, it should be cut down.